Dopamine deficiency in the basal ganglia is known to cause severe motor dysfunctions such as slowness of movement, or bradykinesia, as seen in Parkinson’s disease. Dopamine binds D1 and D2 receptors that are expressed in the nerve cells of the striatum, a structure of the basal ganglia, and exerts different effects on the nerve cells. However, how dopamine controls these receptors, the information flow in the basal ganglia or voluntary movements is still unclear. Now, a study from researchers at the National Institute for Physiological Sciences, Kitasato University and Niigata University has shown that a lack of dopamine transmission through the D1 receptors disturbs information flow through the direct pathway in the basal ganglia, and causes disruption to voluntary movements. The team state that this finding provides important clues to develop new therapies to the disease, such as on-demand activation of D1 receptors to facilitate the information flow through the direct pathway. The opensource study is published in the journal Cerebral Cortex. Previous studies show that the loss of dopaminergic inputs to both the direct and indirect pathway neurons is considered to increase firing rates of entopeduncular nucleus (EPN)/substantia nigra pars reticulata (SNr) neurons, resulting in the decreased motor activity seen in PD. However, the exact role of D1R-mediated dopaminergic transmission in vivo is not well understood. Contradicting results have been observed following D1 receptor blockade. D1 receptor knockout mice show increases in spontaneous locomotor activity, although pharmacological blockade of the D1 receptors induces locomotor suppression. The current study used a novel transgenic mouse model in which dopamine D1 receptors can be reversibly reduced by a pharmacological agent doxycycline, and found that the mice showed decreased movements when D1 receptors were reduced. The team used electrophysiological techniques to examine the electrical activity of the nerve cells in the entopeduncular nucleus (EPN), the homologous structure to the internal segment of the globus pallidus in humans, that is the output station of the basal ganglia. The lab explain that normally the electrical stimulation of the motor cortex causes triphasic response consisting of early excitation, inhibition and late excitation in the nerve cells of the EPN and acts to initiate movements. Results show that when D1 receptors were reduced in the transgenic mice by doxycycline, the triphasic response was changed, and the inhibition was largely decreased. The team state that this suggests that dopamine transmission mediated by D1 receptors is essential for information flow through the direct pathway to appropriately initiate movements. Data findings show that spontaneous activity of nerve cells in the ENP did not change when D1 receptors were reduced, which denies the prevalent view that lack of D1 receptor-mediated dopamine transmission increases spontaneous nerve cell activity in the EPN. The results suggest that transient activity changes through the direct pathway, not spontaneous activity changes, in the EPN are responsible for slowness of movements in Parkinson’s disease. The team surmise that they have shown that lack of dopamine transmission via D1 receptors disrupts information flow through the direct pathway and results in slowness of movements in Parkinson’s disease. For the future, the researchers state their findings also suggest that phasic activity changes in the EPN through the direct pathway are fundamental to both normal functions of the basal ganglia and the pathophysiology of movement disorders. Dopamine D1 receptor (D1R) suppression in D1R knockdown (D1RKD) mice with doxycycline (Dox) treatment. (A) Schematic diagram showing the cortico-basal ganglia pathway and stimulating (Stim.) and recording (Rec.) sites in the electrophysiological experiments (left), along with a typical response pattern (right) in the entopeduncular nucleus (EPN) (homologous to the internal segment of the globus pallidus, GPi) to cortical stimulation (Cx Stim.) 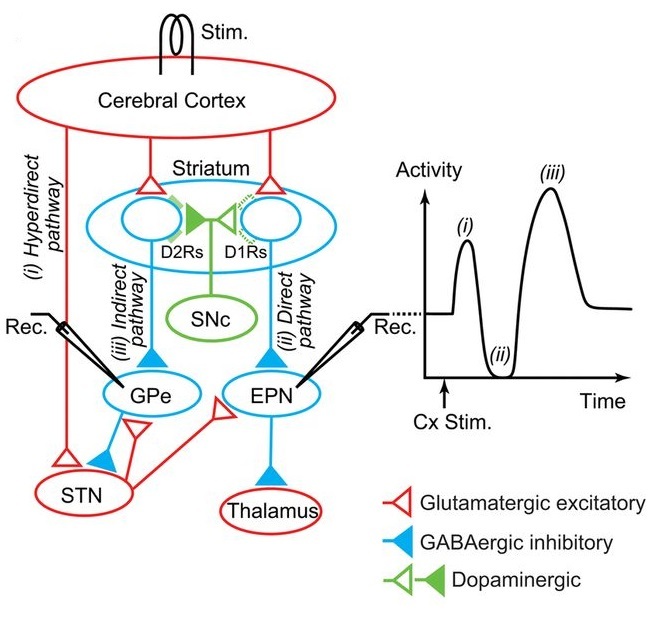 with early excitation, inhibition, and late excitation, which are mediated by the i) cortico-subthalamo (STN)-EPN hyperdirect, ii) cortico-striato-EPN direct, and iii) cortico-striato-external pallido (GPe)-STN-EPN indirect pathways, respectively. Red, blue, and green triangles represent glutamatergic excitatory, GABAergic inhibitory, and dopaminergic projections, respectively. D2Rs, dopamine D2 receptors; SNc, substantia nigra pars compacta. Dopamine D1 Receptor-Mediated Transmission Maintains Information Flow Through the Cortico-Striato-Entopeduncular Direct Pathway to Release Movements. Chiken et al 2015.